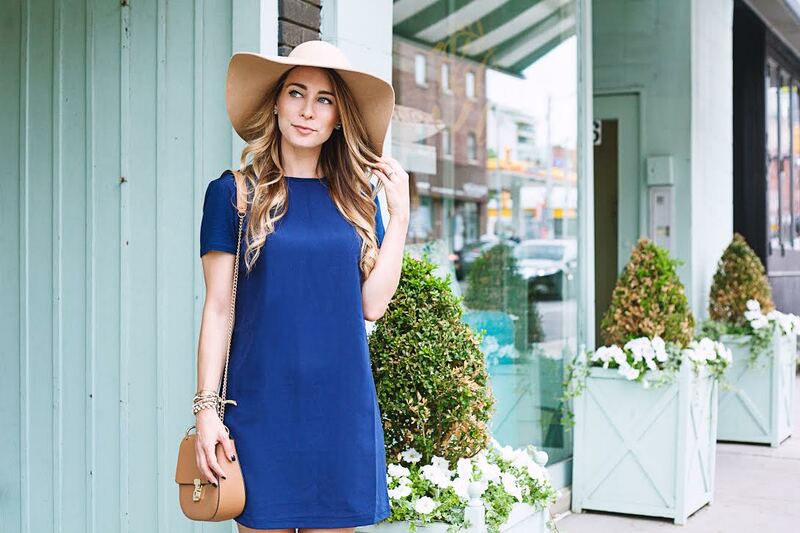 OOTD - Navy Shift Dress For Travel | La Petite Noob | A Toronto-Based Fashion and Lifestyle Blog. Lately I've been battling some pretty serious wanderlust - you know, the type that has you so itching for adventure that it takes everything in you not to run to the nearest airport to purchase a plane ticket to anywhere. Knowing that our next trip isn't until the end of August, I've managed to get a control the travel-bug with getting out to different parts of the city and exploring Toronto beyond the comfort of my own neighbourhood. When the beautiful Cynthia from Pinch of Chic suggested that we meet in her area of TO, I jumped at the chance! You guys know how much I love meeting fellow bloggers, and getting to explore an unknown area was icing on the cake. I chose to wear an outfit that I would likely wear while traveling; a breezy navy shift dress, trusty Chloé 'Drew' inspired bag from Forever 21 and my favourite Camel traveling hat. Simple, classic and totally comfortable -everything that you would want in a travel outfit, even if it is while playing tourist in your own city. You guys, I know I said that I was not an advocate of fast-fashion bags in my last post but this Chloé-inspired number from Forever 21 is slowly making me re-think my previous stance. There is something to liberating about wearing a bag that is so low-maintenance and easy. While before a few raindrops would have me diving head-first into the indoors to save ruining my leather purse, the man-made material of this particular bag is totally weather proof. I honestly just don't even think about it! My mind still isn't 100% made up as to my feelings towards fast-fashion bags, but this one from Forever 21 is making quite the case in favour of them. What do you think of my travel-inspired outfit - is it something that you could see yourself jet-setting in as well? How often do you play tourist in your own town? Let me know! I love t-shirt dresses! So comfy and chic! Ohhh, I love t-shirt dresses too Brenda! I love how they're so comfortable and an instant-outfit! Isn't it fun to be a tourist where you live? I find that it's given me a totally new appreciation for my city! Thanks for your kind words Kim, I'm glad that you like the hat! You look so beautiful! Everything about this is just so classic. No way Karen, you could totally wear a dress like this and look beautiful! I think you'll like Cherry Beach, it's small but charming. I've only ever been during the week, but I've heard that as long as you get there well before noon on a weekend you should get a chair. Thanks for the tip Joelle! I've actually been looking at the Toronto beaches online and couldn't decide which one to go to first. Pretty sad I'm only 30 minutes away and have never been.....booo! Ohhh Everlane... they're e-mails are always a practice in self-restraint! I LOVE this outfit. I found you on stylegawker and now I’m following through bloglovin’. I’m co-hosting a link party at The Sugar Ribbon Blog and I’d LOVE if you’d stop by and share your link. I would definitely wear this on a road trip or something like that! I can't deal with having exposed legs on airplanes, it just feels icky to have my legs touching leather seats that probably haven't been thoroughly cleaned recently. Being a tourist in your own town is such a good idea though!